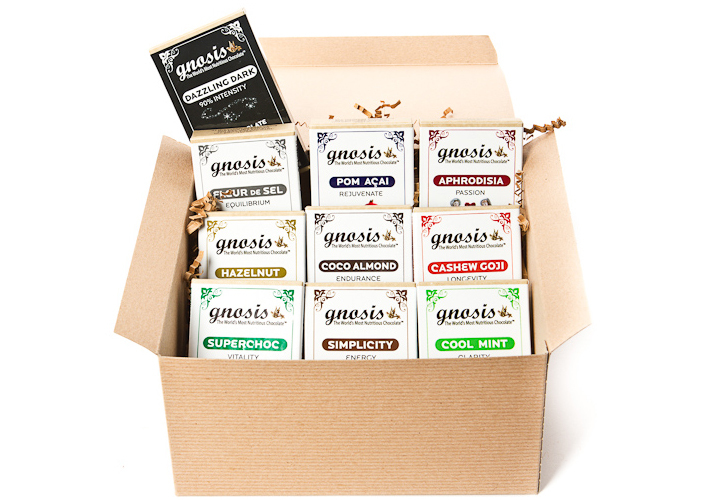 Save 10% - 30% with Gnosis Chocolate Club! The Gnosis Chocolate Chocolate Club is the easiest, smartest, most delicious way to get your raw chocolate groove on - direct from our kitchen to your door once a month - at a discount of 10-30% off our retail price including shipping! This program is FULLY CUSTOMIZABLE - you aren't locked into anything :) If you're going out of town, just let us know - we'll place a pause on your program. How easy is that!? Just tell us how many bars, which flavors, and how long... we'll take care of the details! MIX IT UP! We're happy to change your flavors each month - just let us know what you'd like by the 10th of each month - we ship on the 15th. PLANET FRIENDLY! We ship direct to you instead of to a store so you don't have to use valuable natural resources to drive to pick up your stash. SAVE MONEY! You will save from 10-30% over the cost of purchasing bars separately. AND Shipping is included on all orders delivered to US addresses. Place your order & we'll be in touch to ask which flavors you'd like this month!